For our 2012 EU Parliament study on Employee participation in the European Union, we published best practice case studies on both companies and countries. Here you find the full version of our best practice case study on Voestalpine, one of the worlds largest steel producers. Voestalpine became partially owned by its employees after the privatization in the year 2000. -we would be happy to hear your thoughts on this case study. Voestalpine AG—headquartered in Linz (Austria)—is mainly active in the production and treatment of steel. As a successful international corporate group with some 300 production and sales companies in more than 60 countries, it has nearly 40,000 employees (fewer than half of them in Austria). In conjunction with discussions about the full privatisation of the corporate group undertaken at the beginning of 2000, the group’s Board of Management together with the employee representatives developed and later implemented an employee participation scheme, which at that time was unprecedented in Austria. Through this, a large portion of the group’s workforce as well as a small group of ex-employees currently hold a 13.3 per cent stake (around 22 million shares) administrated by a private foundation (Voestalpine Mitarbeiterbeteiligung Privatstiftung). In 2000, the Austrian Government—under Chancellor Wolfgang Schüssler—enacted the so-called ÖIAG Act133 with the intention of accelerating the privatisation process among (partial) state-owned industrial companies. One of these companies administrated by the Austrian Industry-Holding Company Stock Corporation ÖIAG (Österreichische Industrieholding AG) was the Voestalpine AG. In 2000, ÖIAG administrated a state-owned stake of 38.8 per cent, which subsequently was slightly reduced in two steps to 34.7 per cent. In 2003, the Austrian Council of Ministers mandated ÖIAG to fully privatise the Voestalpine AG. Against all concerns, in the context of the so-called secret project “Minerva”, a hostile takeover by Magna was prevented, and since August 2005 the Voestalpine AG has been fully privatised (Auer, 2008, pp. 245-249). In response to the privatisation ambitions of the Austrian Government, in 2000, the Voestalpine management in co-operation with the group’s employee representatives immediately started intensive discussions about the group’s future ownership structure. In the course of these talks it became generally accepted by both parties that a substantial equity stake owned by the group’s workforce could contribute to a more stable ownership structure (strategic ownership). From the very beginning, an ambitious plan was conceived to acquire in the short and medium term an employees’ stake of not less than 10 per cent of the total number of voting rights (Voestalpine Mitarbeiterbeteiligung Privatstiftung, 2010, p. 20). Through the first of the six employee participation schemes implemented so far, the Voestalpine workforce in Austria acquired an immediate 4.9 per cent equity stake (around 1.6 million shares). Once again, based on opening clauses in relevant wage agreements, an additional wage agreement (Zusatzkollektivvertrag) was fixed between social partners (Labour Union and Economic Chamber) on 1 November 2000, which allowed the group’s management to retain parts of concluded pay increases for the purpose of attaining the employee share ownership target. Thus, one per cent of monthly employees’ gross wages in combination with company’s savings in non-wage labour costs arising from stock transfers134 and a yearly value adjustment of employees’ own contributions135 were the basis to calculate within the complex Barwert- modell (Cash Value Model) the total advance of money used for the acquisition of the above mentioned 1.6 million shares at the stock exchange (Voestalpine Arbeitnehmer-Privatstiftung, 2006, p. 12). An irreplaceable element of the first and all later schemes—the still extant private foundation—has been utilised and developed. The Voestalpine Mitarbeiterbeteiligung Privatstiftung is not only responsible for the administration of the acquired stock, but also concentrates all individual employees’ voting rights due to a transfer of the ownership’s civil claim, fixed within integrated trust agreements (Treuhandverträge). Thus, it is ensured that the work- force has an important vote within the General Meeting of Shareholders. On the other side, the individual right to receive a dividend remains in employees’ hands. To fully utilise tax incentives according to § 3 I Z. 15 lit. b of the Austrian Income Tax Act and savings in social security contributions according to § 49 III Z. 18 lit. c of the Social Security Act, acquired shares were just allocated to employees to a maximum limit of EUR 1,460 per year. Employees’ shares remain within the foundation for the entire period of employment. All relevant regulations—e.g., relating to the retention of employees’ pay increases or the allocation of shares to individual employees—were concluded within the internal company agreement mentioned under 2.1 (Voestalpine Mitarbeiterbeteiligung Privatstiftung, 2010, p. 33). For all employees hired after 1 November 2000, a Schichtmodell (Shift Model) was developed, which calculated the employee’s own monthly contribution in accordance with the Barwertmodell (one per cent of the employee’s monthly gross wage, the company’s savings in non-wage labour costs and a yearly value adjustment (3.5 per cent) of this contribution) (Voestalpine Arbeitnehmer-Privatstiftung, 2006, p. 12). Strategic employees’ share ownership has been further promoted through five additional schemes (II-VI). All of these have been based on additional wage agreements to retain a percentage of employees’ pay increases . Furthermore, the financing of the monthly employees’ own contribution in all schemes is accordant with the Schichtmodell (model I). Unlike the initial scheme, the pre-financing of shares in the following schemes II, III and V was leveraged (credit-financed). In 2002, scheme II increased the existing employees’ stock136 by 2.5 per cent (around one million shares), and in 2003 the so called “squeeze-out-boundary” of ten per cent was overstepped for the first time by the purchase of around 1.5 million shares (3.7 per cent). Since then, the Voestalpine Mitarbeiterbeteiligung Privatstiftung on behalf of the workforce has been empowered to nominate a representative to the Supervisory Board. This achievement was only once put at risk when in 2005 the Voestalpine AG issued convertible bonds and increased the group’s share capital. Thus, at the end of 2005, a fourth scheme was concluded, through which the Voestalpine AG between 2007 and 2009 credit financed the purchase of about 3.2 million shares137 (two per cent) on the stock exchange and transferred them to the Voestalpine Mitarbeiterbeteiligung Stiftung (Voestalpine Mitarbeiterbeteiligung Privatstiftung, 2010, pp. 38-44). Based on an additional wage agreement—reached in the course of collective bar- gaining in the metal industry—, a fifth scheme was started in November 2007, mainly in order to integrate a large number of new Voestalpine staff—particularly from the BÖHLER-UDDEHOLM-Group—into the employee participation scheme. It was agreed to allot 0.5 per cent of their monthly gross wages for this purpose. On the other side, the monthly contribution of already participating employees was raised by 0.3 per cent of their monthly gross wages. Deviating from the procedure in previous models, shares still available within the foundation were utilised for this new allocation. Scheme VI—implemented as a result of a conditional capital increase—enlarged the employees’ stock within the foundation by two per cent, i.e., 3.3 million shares (Ibid., pp. 46-48). Today, Austrian employees spend up to 3.25 per cent138 of their monthly gross wages for the allocation of shares (Ibid., p. 48). execution of voting rights at the General Meeting of Stakeholders. The two main bodies of the foundation are the Management Board and the Advisory Board. The group’s Board of Management and Works Councils nominate its members equally.139 Both bodies are chaired by an employees’ representative, who—in case of a tie—casts the deciding vote (Dirimierungsrecht). The Advisory Board makes all decisions concerning employee participation schemes—e.g., their further development—and is responsible for appointing the Management Board. The chairman of the Management Board represents the voting rights of all participating employees at the General Meeting of Stakeholders. His vote at the meeting is restricted by the decisions of the Advisory Board, which are always taken on the basis of a suggestion by the Management Board and a wide opinion-building process among the group’s Works Councils. The Management Board is further responsible for administering the participation scheme and also foundation assets140. As presented within the introductory remarks of this chapter, the strategic dimension has been the driving power in 2000 to apply such an ambitious employee participation scheme. The Voestalpine Mitarbeiterbeteiligung Privatstiftung on behalf of the workforce has been the most stable core shareholder for years. Today, it is the second largest shareholder (13.3 per cent141) after the Raiffeisenlandesbank Oberösterreich Invest GmbH & Co. (more than 15 per cent). The chairman of the foundation’s governing body represents 12.4 per cent of the voting rights within the General Meeting of Shareholders (Voestalpine Mitarbeiterbeteiligung Privatstiftung, 2010, pp. 62 f.). In addition, since 2003 the foundation has had the power to nominate a representative for the Supervisory Board. From a financial perspective, the workforce’s capital investment has absolutely proved its value. 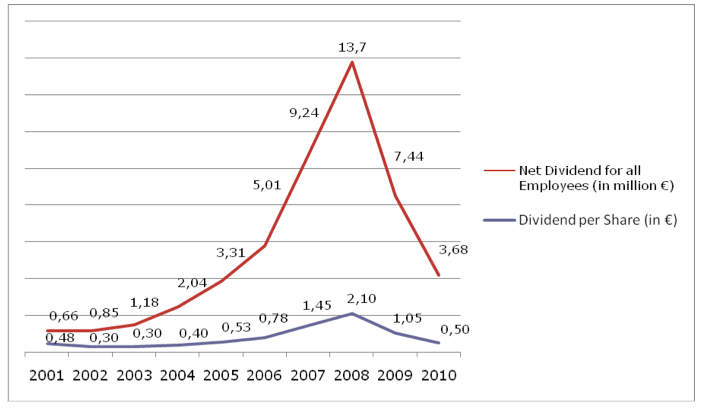 As Figure 23 shows, each year since 2000 the Voestalpine AG has declared a dividend. In total, between 2000 and 2010 it has distributed EUR 47.3 million in dividends to participating employees. Source: Voestalpine Mitarbeiterbeteiligung Privatstiftung (2010), p. 32. As proof of the employees’ confidence in their capital investment, 17 per cent of them (3,576 individuals) have decided to re-invest their dividend. Furthermore, at present, 3,277 individuals—either still active within the Voestalpine AG or already separated from it— exercise their option to keep their “private shares” (around 1.6 million shares) within the Voestalpine Mitarbeiterbeteiligung Stiftung. Among them are almost two thirds of all employees, who left the group within the last three years (Voestalpine Mitarbeiterbeteiligung Privatstiftung, 2010, pp. 62 f.). The results of the previous chapters should help to answer whether the employee participation scheme of the Voestalpine AG, whose general structure resembles an ESOP, deserves to be designated as “best practice” and if it is transferable or has already been transferred to other companies. Comparing potential implications or benefits collected in chapter 2 with those from the Voestalpine example, it is evident that both the Voestalpine employees and the Voestalpine AG itself have demonstrably benefited from such an ambitious employee participation scheme. Even though not solely intended as an employee financial participation scheme, it has created an additional source of income for all participating employees. Furthermore, the objective to establish strategic ownership has been fully achieved and the workforce has been put in a position to contribute as a key stakeholder to the group’s future. Thus, to a certain extent, it seems possible for them to support their own concerns, in particular job security. From the employer perspective as well, the Voestalpine AG has strategically benefited from its courageous decision to implement strategic employee share ownership. It not only reacted flexible to the privatisation process, but also established a stable anchor shareholder under its ownership structure, present and future, i.e., its employees. As for negative results or implications, none could be identified. It must be mentioned, however, that for several of these criteria no data is available in the Voestalpine case (e.g., if production has increased after the introduction of the employee participation scheme). Nevertheless, positive implications reported for Voestalpine employees as well as for the Voestalpine AG itself are important indicators that the Voestalpine case can undoubtedly be labelled as an example of best practice. Acknowledging that the Voestalpine employee participation scheme deserves the appellation of best practice, it is interesting to speculate whether it could easily be transferred to companies in or even outside of Austria. With respect to its export potential, the efforts of the Voestalpine AG to adapt certain features of the Austrian models to Voestalpine companies in other EU Member States have clearly shown the difficulties. In particular, widely differing national labour and tax regulations have made this implementation impossible. Therefore, both of the international models142 so far implemented are based on conditions different from those of the Austrian models, although oriented around general characteristics (such as concentration of the voting rights within a private foundation143) (Voestalpine Mitarbeiterbeteiligung Privatstiftung, 2010, pp. 50-53). At first glance, it seems possible to duplicate the Voestalpine employee participation scheme within Austria. Nevertheless, certain aspects still narrow its transferability. First, the scheme is not appropriate for small and medium-sized companies inasmuch as the integration of a private foundation as well as a large administrative workload is too expensive for them. Furthermore, the employee participation scheme has been designed to fit certain circumstances, conditions and objectives. Thus, the question of whether it would work under (partly) different conditions is an open one. In conclusion, this case has shown how the Voestalpine model—with its strong positive effects on the workforce as well as on the entire corporate group—deserves to be designated as best practice. Nevertheless, its transferability abroad is limited, above all because of the particular legal structure. Within Austria, though it is possible to duplicate the model. In practice, transfer to small and medium-sized companies will hardly be an option because of implementation and administrative costs arising from the private foundation. 133 The ÖIAG Act was publicly announced in the Federal Law Gazette 1 no. 24/2000. 134 According to the Social Security Act, employers in Austria are not required to pay non-wage labour costs in case of stock transfers. In the example of the Voestalpine AG it was decided to pass these savings on to employees, thereby increasing their own contribution about 25 per cent. 135 The calculation included a yearly 3.5 per cent increase in employees‘ contributions. 136 At this time, the stake already had been decreased to around four per cent in consequence of an increase in capital. 137 As a result of a share split in July 2006, each share had been split into four. 138 All implemented schemes increased the amount taken from the monthly gross wage: scheme I (one per cent), scheme II (0.5 per cent), scheme III (0.5 per cent), scheme IV (0.5 per cent), scheme V (0.5 per cent in case of new integrated employees and 0.3 per cent in case of already participating employees) and scheme VI (0.45 per cent). Thus, an employee involved in the employee participation scheme since the beginning spends at the moment 3.25 per cent of its monthly gross wage for the allocation of shares. 139 The Management Board consist of three members (the third member is collaboratively nominated) and the Advisory Board of 12 members. 141 The 13.3 per cent stake mainly includes the share ownership of Austrian employees, but also in a small part of German and British employees as well as of ex-employees. 142 In 2004, the first international-oriented model was implemented for Voestalpine staff from the Netherlands. Based on these experiences early in 2007, it was started to develop a common international model. So far, this was implemented in Great Britain and Germany. In Belgium and Sweden, legal boundaries and the impacts of the economic crisis have prevented an implementation. 143 While the Dutch model concentrates all voting rights in an own private foundation, voting rights from the international model are held in the Austrian Voestalpine Mitarbeiterbeteiligung Privatstiftung. 144 Information provided by Max Stelzer, Management Board Executive Voestalpine Mitarbeiterbeteiligung Privatstiftung, to the author. Auer, H.S., 2008. Neoliberalismus in Österreich? Hochschulpolitik, Gesundheitspolitik und Wirtschaftspolitik der ÖVP-FPÖ/BZÖ-Koalition auf dem Prüfstand, Norderstedt. Lowitzsch, J. and Spitsa, N., 2008. The legal framework for implementing financial participation at the supranational level. In Lowitzsch, J. et al., Financial Participation for a New Social Europe. A Building Block Approach, Rome and Berlin: Inter- University Centre, Free University of Berlin, pp. 71-88. Available at: http://www.intercentar.de/en/research/focus-financial-participation-of-employees/. Stelzer, M., 2010. Employee Participation voestalpine AG. Ten Years of Public Policies for Employee Ownership in Europe. Presentation in Brussels, 26 November 2010. Voestalpine Arbeitnehmer-Privatstiftung, ed., 2006. Ein Stück vom Erfolg persönlich genießen. Die Entwicklung der voestalpine Mitarbeiterbeteiligung 2000-2006, Linz. Voestalpine Mitarbeiterbeteiligung Privatstiftung ed., 2010. Wir sind daran nicht ganz unbeteiligt. Die voestalpine-Mitarbeiterbeteiligung 2000-2010, Linz.